One of my customers, Independent Floor Testing and Inspection has been on this quest since I started working with them in 2010. This past week during a monthly meeting we had the time and the focus to truly work on it. One of the leadership team members, Greg Mercurio, came prepared to passionately express his ideas and direction for the company. IFTI, as Independent Floor Testing and Inspection isn’t a large company, yet, but they’ve been growing at a fast pace in the past year, increasing 50% in 2015 and headed north of 23% this year. WHO: An overwhelmed construction professional who has experienced the pain of moisture related problems and urgently needs a proven system that cost effectively reduces their risk with multiple commercial projects. WHAT: The third party specialist in concrete slab moisture testing using its proprietary process to deliver reliable data, assess risk, and provides a range of cost effective solutions for commercial facilities throughout North America. HOW: Prove that painful, costly, and time consuming moisture related problems are unnecessary by demonstrating the value of IFTI’s proprietary process that reduces the risk of moisture related problems through IFTI’s unbiased assessment, scientific data, and cost effective solutions. We discovered IFTI’s Core Purpose, Brand Promise and have completed the Strategy Statement process twice, just updating it this year since our time frame had expired. All these strategic items have helped a great deal in moving the needle on IFTI’s growth, culture and President Lee Eliseian’s freedom and confidence in how the business functions without him involved in the day-to-operations of the business. IFTI is growing currently at a good clip, yet the Inside Advantage, actually posed an obstacle in helping them create their BHAG. The plan moving forward is to be more than a concrete moisture testing company. What they plan to be is the challenge. We’ve spent several years hashing through their BHAG, only to be stymied but the uncertainty of what the future actually looks like beyond moisture testing. 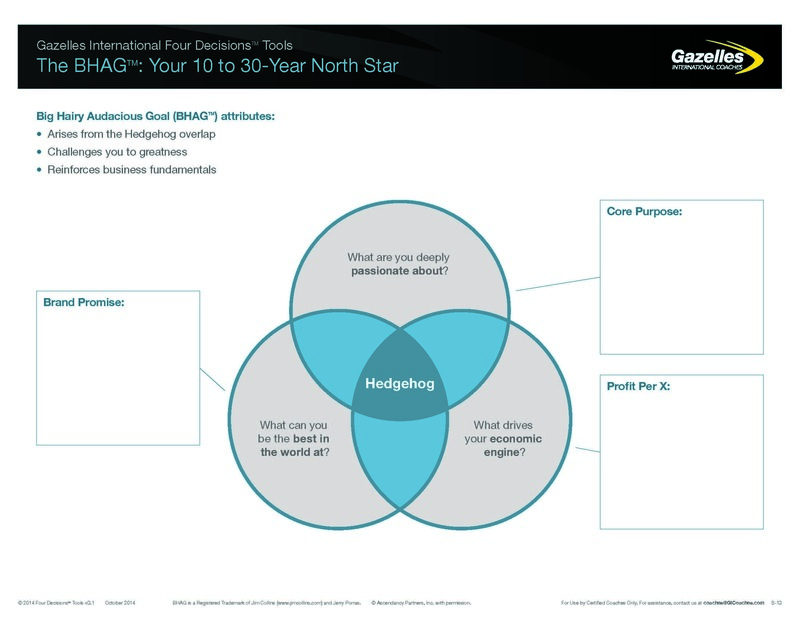 Determining your BHAG is the intersection of the three circles of your Hedgehog Concept. In Good to Great Jim Collins noted, “It took about four years on average for the good-to-great companies to clarify their Hedgehog Concepts. Like scientific insight, a Hedgehog Concept simplifies a complex world and makes decisions much easier. But while it has crystalline clarity and elegant simplicity once you have it, getting the concept can be devilishly difficult and takes time. Note Collins mention of the word iterative. It requires repetition. 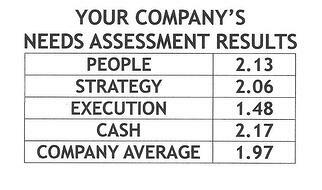 One effort at your BHAG without the effort to determine the following questions and you’re not going to get much out of the exercise. 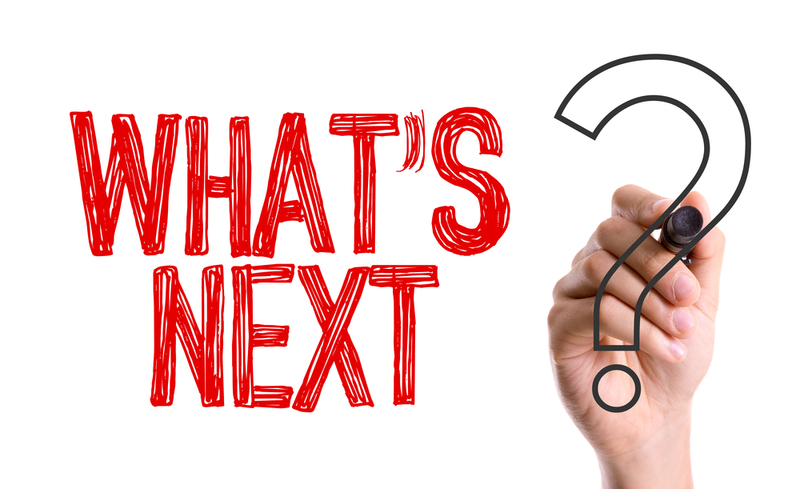 On the One Page Strategic Plan you’ll discover we help you identify the answers to each of these three questions, by including entry points for Core Purpose, Brand Promise, Profit Per X and of course BHAG. Once you’ve identified your Uncommon Advantage you still need to determine if this is truly what your customer needs, and then does a competitor in your market already own this position? Are they first to market with your customers? Discovering your customer needs is the first step in building your Brand Promise. The next step is to determine what you are best at. Again if your competitor is better, or is already identified with what your best at, you need to establish your advantage, and choose something you can be best in the world to offer what your customer really needs. Finally you need to measure your results. Your Brand Promise must be measured. Look at Rackspace as an example provided in Seven Strata of Strategy - Brand Promise. One of my former customers discovered his profit per X. By putting his emphasis on this element of his business he’s been able to grow and expand his business exponentially putting his managers and staff in a position to focus on customers in a manner that they’d not done in the past. The result has been growth and expansion in an industry that is been stagnant for many years nationwide. Positioning Systems Strategic Discipline blog provides 22 messages on Core Purpose. Defining who you are as a person and a business demands you identify this. If you’ve not viewed Simon Sinek’s Ted Talk on the value of Core Purpose visit Want To or How To: People & Core Purpose to watch it now. None of these happen overnight. A business coach will provide you with the tools and experience to help you identify these and ultimately help you determine your BHAG. Even if you didn’t need help identifying these, you probably need help being accountable to the practice of identifying these as well as why they can be critical to your growth. You do want to be great don’t you?